This part contains a nisin inducable promoter from Lactococcus lactis. The part was validated by constructing an expression vector based on the native vector where the part was amplified from: pNZ8048. 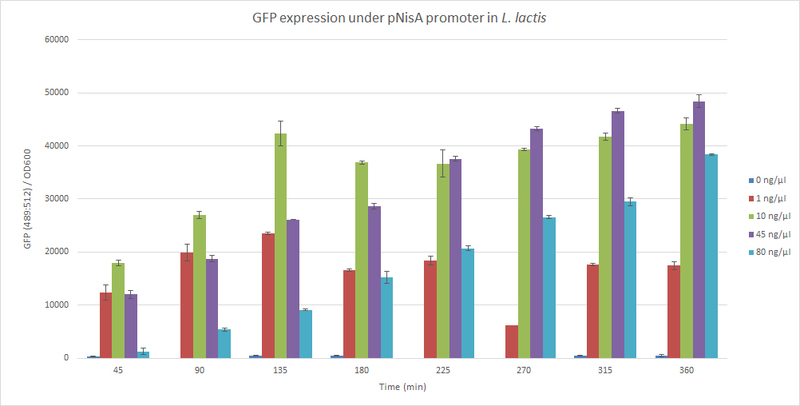 This native lactococcal plasmid was used as backbone to integrate the coding sequence for GFP behind the promoter. This enabled us to obtain data on its inducible character. This was done by inducing the cells with various amounts of nisin once the cells were in the exponential growth phase (OD600: 0.5-0.6). The graph below shows the expression of GFP over a time period of 6 hours. The values shown are a ratio of GFP emission over the absorbance at 600 nm to correct for varying growth rates.